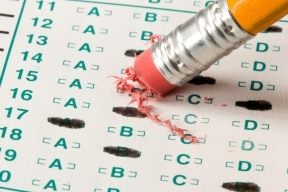 At least 20,000 students in Illinois public schools did not participate in PARCC testing this past spring, according to More Than A Score, a coalition fighting high-stakes standardized testing in Illinois. This is at least a ten-fold increase over opt out numbers in Illinois the previous year. “The massive increase in opt out numbers shows how strongly Illinois families feel that PARCC is an illegitimate test and a poor use of educational resources,” said Kylie Spahn, Downers Grove parent of two students who refused PARCC. More Than A Score’s numbers are based on Freedom of Information Act (FOIA) requests by parents to more than 150 districts around the state, in addition to surveys and previous media reports of opt out numbers. The Illinois State Board of Education (ISBE) has repeatedly stonewalled FOIA requests for official opt out numbers, claiming that data was still preliminary months after districts completed PARCC testing. District counts of the number of non-tested students total at least 6,000 in elementary and combined elementary-high school districts. In high-school-only districts, at least 5,400 students refused or were absent from the English Language Arts test; and 2,100 from the mathematics test. Numbers obtained from the Chicago Public Schools earlier this summer by the education publication Catalyst Chicago, had at least 9,600 students refusing. Because this data includes fewer than 20 percent of Illinois’ school districts, the actual numbers of non-participating students is probably significantly larger. More Than A Score organizer, Cassie Creswell, said Tuesday that the organization would continue to support parents and students refusing state-mandated testing in Illinois this year. “We expect that the release of PARCC scores will further reinforce that the test is an expensive boondoggle designed to set our schools and students up for failure. We don’t need to pay Pearson to tell us that Illinois continues to shortchange its public schools.” Illinois signed a four-year, $160 million contract with Pearson for PARCC testing in June 2014. In September, ISBE announced preliminary state-level score information for Illinois, where 70% of students who took the online version of PARCC were labeled as not meeting expectations. Three weeks ago ISBE said that Pearson was sending individual student scores to districts and schools but has forbidden this data to be released publicly before the end of November.